I have worked through this course over a few days. Derek has set it out really clearly and gives a great explaination of Anxiety and offers amazing techniques that you can follow to use immediately and stop anxious feelings quickly. This is so valuable and at any point you can refer back to the techniques. You have developed an effective product that will make such a difference to those who buy it. Great work your doing Derek. Almost a year that I had panic attacks and anxiety. I got some medicines from a doctor in Thailand but didn’t take them because I was afraid of the side effects. Everyday I spent my life depressingly until I met Derek (He’s here in Thailand for traveling) He helped me with some incredible technics to get rid of it easily. It’s just unbelievable! I had never thought that I would be able to get over it. Now, I’m living my life happily. I feel so independent. Must thank Derek. He is very professtional and is also a very kind person. If you’re experiencing anxiety or even the panic attacks. I would definitely suggest you seeing Derek to have a big good change of life! 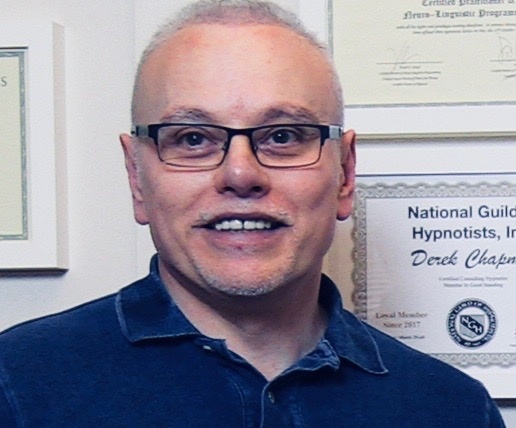 Derek Chapman is a Hypnotherapist and Coach people like his no-nonsense approach. Making the complex simple. He works with individuals and businesses owners so they can be happy and increase their productivity. Creator of :The Anxiety Wheel ,The Russian doll Technique, and The Awesome Therapist. He reframes change work and hypnosis in a ways clients and therapists can easily understand.